Forget about spring break in Florida, the Southwest is where summer fun starts! The desert southwest is glorious year-round, but spring is, by far, the best time of year to go. Spring starts early here, making southern Utah and northern Arizona into paradise while the rest of the country still digs itself out of the snow. Vibrant red rocks contrast with clear blue sky. Wildflowers claw their way out of the ground and bloom into yellows, whites, reds, and purples. And the warm breeze carries the scent of juniper and mesquite. Check out these top five reasons it’s time to head south this spring. If you think of the desert as a lifeless pit of sand and rock, you couldn’t be more wrong. As the snow melts (yes, it snows in the desert) and early rain showers sink into the desert soil, green seems to erupt followed by an explosion of color as the wildflowers take advantage of the rare moisture. Everything from low-key sand verbena to bright yellow desert marigold to scarlet indian paintbrush to intense purple of Zion milkvetch, the desert floor seems to light up with color. And that’s not even counting the cactus like prickly pear and chollas. About once a decade, the desert receives a combination of heavier-than-normal winter precipitation and a warm spring creating ideal conditions for a “superbloom”. You’ll never forget the miracle of a desert in full bloom. The deserts of the southwest have some of the best hiking on the planet. Unhindered by dense forests or air pollution, the view seems to go on forever. Whether it’s exploring deep canyons, or climbing juniper-studded mesas, spring is the perfect time to hit the trail for all-day hikes. During the summer, pre-dawn starts are common practice to beat scorching temperatures that can top 100-degrees Fahrenheit. Consider heading out during spring to avoid having to get up at 4am on vacation. Photographers in search of perfect light can find an abundance of it in the desert during spring and fall. The sun seems to linger on the horizon late into the morning and hangs on the horizon for half the afternoon. In fact, in Utah’s northernmost parks like Canyonlands and Arches, early spring sun remains low enough that you can get passable photos all day. Spring weather patterns also tend to keep coastal smog away, making the details crisp. As an added bonus, sunrise and sunset don’t happen at such extreme times of the day, so getting those epic shots won’t require getting up in the middle of the night or missing dinner. Even in the ultra-popular national parks like Bryce and Zion Canyons, the school year dictates the busy season. June, July, and August are the busiest months of the year, even as the temperature soars well over comfortable levels. Drop into the desert southwest before mid-April, and it’ll feel like you’re out in those incredible landscapes on your own. Imagine being the only one at the top of Angels Landing in Zion, and being able to take in the whole of the canyon without five people trying to lean in front of you with their iPhones to get the iconic selfies from the top. Just you and Utah. 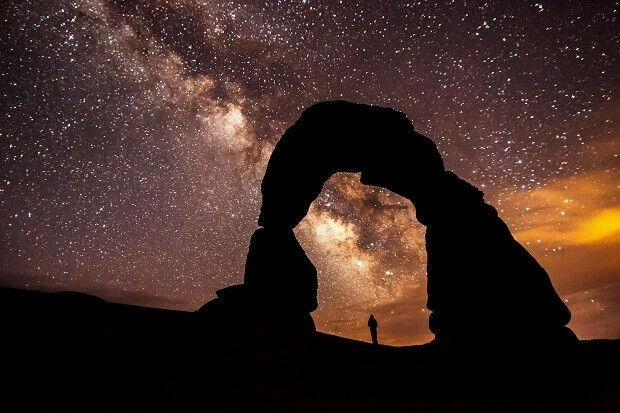 There are so many things that make the desert southwest an excellent destination for stargazers. Low population keeps the night sky blissfuly clear of light pollution. Forests don’t block out the night skies. And, especially in the spring, the wind patterns keep haze from population centers out of the sky. If you’re using a telescope, the chilly desert nights also keep light-bending heat waves to a minimum. Of course, you’ll need to make sure that your telescope acclimates to the air temperature before you start using it. Once your scope is cool, you’re going to find yourself looking up at one of the best light shows on Earth.